ABOVE: A bus of L'OpenTour swings past N�tre-Dame Cathedral on the �le de la Cit�. If you're in Paris for only a short time, or if your body won't withstand hours of walking every day, a traditional escorted bus tour is a great convenience. Our advertising partner, Viator, offers a variety of tours and excursions in Paris and the surrounding area, with prices in a wide choice of currencies. Nowadays, a third option offers a compromise between convenience and independence: the "hop on, hop off" sightseeing bus. 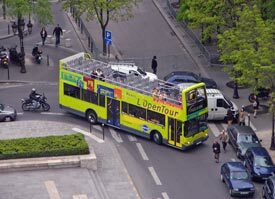 Double-decker buses of L'OpenTour and Big Bus Tours (formerly Les Cars Rouge) follow set routes with stops at leading museums and tourist attractions. For a fixed price, you can step off a bus, explore an attraction or neighborhood at your leisure, and catch another bus when you're ready to move on. As a bonus, you can put on headphones and listen to a running commentary between stops. The green-and-yellow buses of L'OpenTour cover four sightseeing routes that cover most areas of interest to visitors. A single pass gives you access to all four routes. The red-and-gold buses of Big Bus Tours cover two routes: the classic "Red Route" in the city center and a "Blue Route" that skirts Montmartre. You can buy your pass on the bus or save 10 percent by ordering online. Language note: Both companies have recorded audio tours in multiple languages (11 for Big Bus Tours and 10 for L'OpenTour the last time we checked, with three special commentaries for children on L'OpenTour). Headphones are complimentary. Waiting times: In summer, both lines operate buses at frequent intervals. Wait times are a bit longer in winter. Check the companies' Web sites for current timetables before booking. If you prefer water to asphalt: Try the Batobus (see next page), which extends the "hop on, hop off" concept to the Seine. Note: Other companies offer sightseeing tours of Paris (Cityrama and Foxity come to mind), but we've chosen to focus on the two major providers, who offer frequent service and extensive route networks year-round.